a region that's known for its haciendas and mansions has yet another secret to reveal. 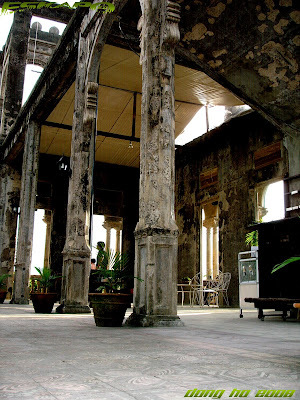 one of Bacolod city's new tourist attraction is the ruins of a mansion. 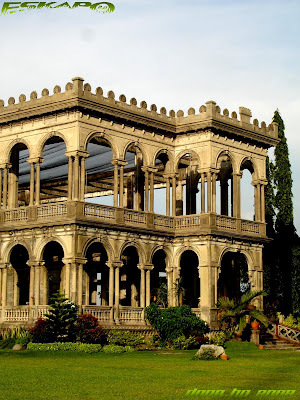 the mansion was built during the 1920s by a sugar baron named Don Marciano Ledesma Lacson. the mansion was based on an Italianate design. the mansion was burned by the US armed forces during the early part of World War II to prevent the Japanese regime to make it as a headquarter. 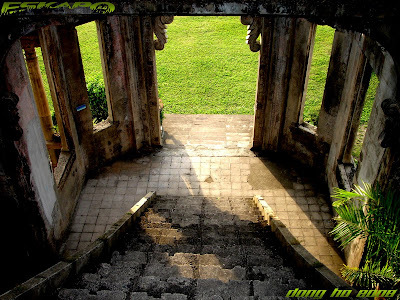 now it stands as a historical structure of a ruined mansion surrounded by a sugar cane field. 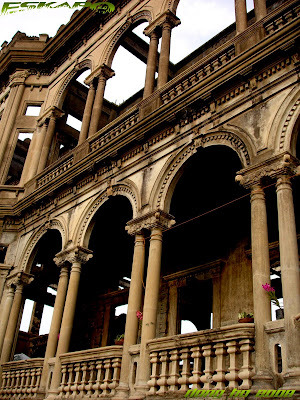 the local officials then decided to retain and preserve what remained from the burnt mansion. they re-developed the landscape of the area and is now attracting a lot of tourists. they were also able to refurbish the mansion's four-tiered fountain which adds a beautiful aura of the place. a damaged tower from outside it's area also stands high as a welcome post to the visiting crowd. when you enter the mansion, you'll only see the beams of the structure which yet displayed a scenic view of the mansions interior. you'll notice the garden area inside the mansion on one side and the dining hall on the other side. there's a verenda facing the mansion's garden. people can dine in this area as food is served within the mansion. 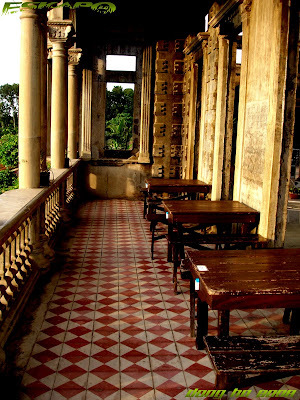 on the second level, what remained from its flooring are the building's foundation and parts of the veranda. you'll see the beautiful pillars of the windows from there. what i like most in the structure is its staircase that gives you a view of the garden, the main door's pillar and its belvedere. the Ruins is open to the public with a minimum entrance cost. it is open from 8:30am to 8:00pm. a tourist guide is available if you want to learn more about the mansion and its history. they also recommend that you see the structure at night as lights adds projection to the mansion. 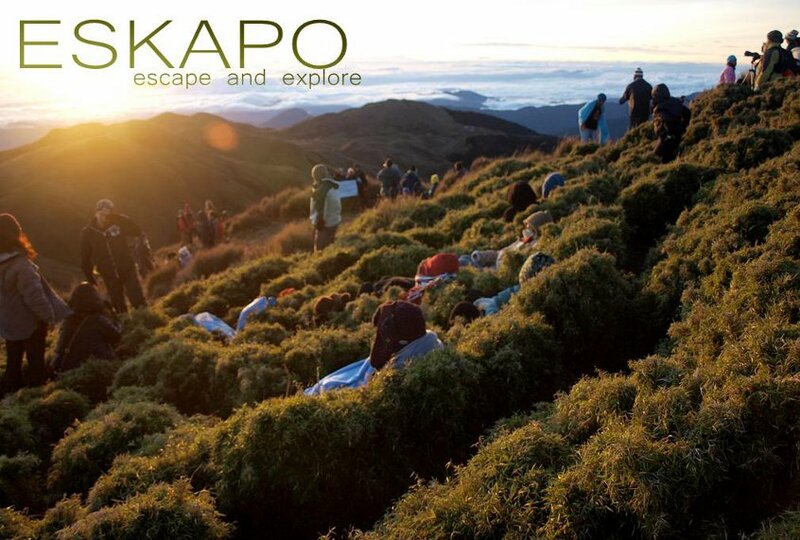 it is just 15-20minutes away from the town proper of Bacolod. minsan na din itong naibahagi ni IFM sa akin at talaga namang humanga ako sa ganda ng mga mansiong ito.Nakakapanghinayang lang talaga dahil sinunog ang mga ito. Mas marami pa sanang maibabahagi kwento ang mansion na ito kung hindi nasunog.. The place looks incredible. I think it would be a nice place for photoshoots. beautiful photos, dong! 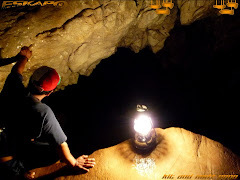 i've never to this place but saw some photos in another blogsite. 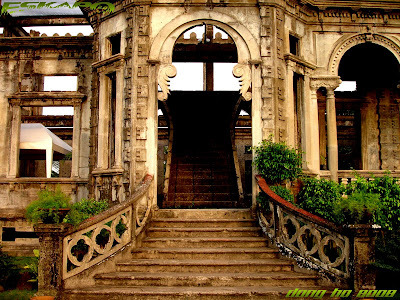 love the architecture...the ruins depict the long lost glory of this mansion. first time ko lang nakita ito dom. may ganyan pala sa bacolod. akala ko pagkain lang masarap doon and dami rin palang pwedeng puntahan. ganda ng mga kuha mo. kahanga-hanga talaga. wow! grandiose. sayang naman. hope it will serve another purpose equal to its best. This is quite an adventure. You take well-composed and quality photos here. 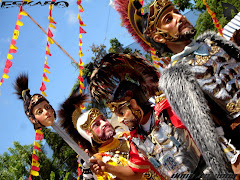 I'd been to Bacolod and neighboring town several times in the past but never had those photos as good as these. What a beautiful place. It's sad when war destroys building (of course the lives lost are worse) but it's good that this still stands so you can see the elegance of the design. Lots of opportunitites to frame things with the doorway and window arches. It's beautiful enough now - must have been breathtaking before it was burned. fabulous images. ang ganda naman. i love ruins so this really is one for me. i completely enjoyed this post. 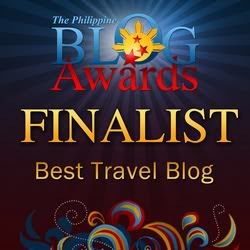 >hi isabetlog, there's enough reason why you need to visit bacolod. at first i thought that negros occidental can only offer the city scenes but it has some nice place to check out. >hi doc rio, it's actually IFM who suggested me to visit this place. oo nga medyo sayang dahil nasunog pero ok na rin kasi iba din ang dating nya. >hi em dy, you're right about that. >slaingpusa, you'll definitely enjoy taking photos of this structure. you'll have a lot of angles to try but it was quite hard during my time because there were people walking around the structure which can quite limit your shots. never been to corregidor. maybe soon but it's not on my plan yet. it is indeed similar to the mile long barracks. >hi luna, thanks. at least it retained its view as a ruin but it surely could have been more beautiful if it was not burned. >oman, maraming salamat bro. daming pwedeng makita sa negros occidental. ako din nung dati akala ko wala masyadong pwedeng puntahan pero dami din pala. sana nga makapunta ka na doon. >joshua, tama ka dyan. 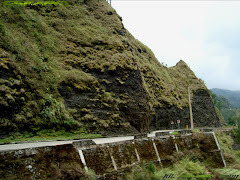 kailangan lang talagang umikot at bumyahe. 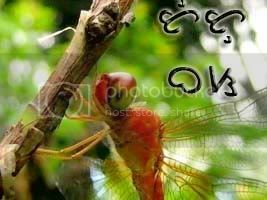 >hi share, thanks! im not using dslr. im using sony dsc p-150. but i really wish to have a dslr. wow! so you really like ruins. >hi aracir, yes. visit it as it has a lot to offer. i like negros occidental. >islander, what's good is its gaining popularity now. the money can help preserve its remaining structure. >antoine, you're right. that's already one of the business that this place offers. it is indeed highly promoted by the local tourism. >dodong, thank you very much. im glad that you like that photos. thank you for the encouraging words. i'll definitely continue taking photos as long as i have my camera with me. >stanley, same with me. i also love visiting places that has old structures. the stories behind it indeed gives it great value. >hi carver, you're right. but what's good is it still retained what remains to be a nice historical structure. >tink, i agree with you. i can't imagine how beautiful it is way back then. >photo cache, thanks a lot! it's nice to know that you liked it. it is really picturesque. Amazing! Parang nakakatakot ata sa gabi yan. The ruin exudes an aura of melancholy and sadness. I wonder if there are spirits guarding it. hehe...o magaling ka lang talaga kumuha ng pics!! 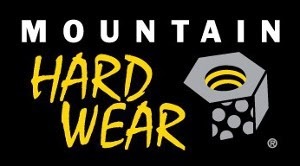 this is nice Dong. this could pass for a whole feature story in a magazine. these photos are a feast to my eyes as i love this theme. and oh, i really like how you frame and chose your angles when it comes to structures and buildings. i should get some tips from you, hehe. galing. wow, what a sight ! Very solid and crisp shots of a historical edifice :) Where's this place bro? It's a pity they did not restore this mansion. Kahit sira na elegante pa rin. Beautiful clear and crisp shot of every single one. The place although looks run down. It's still holds on to glory. Fantastic places, gorgeous photos by an excellent photographer! Fantastic sequence, Dong. This mansion ruins are so attractive! 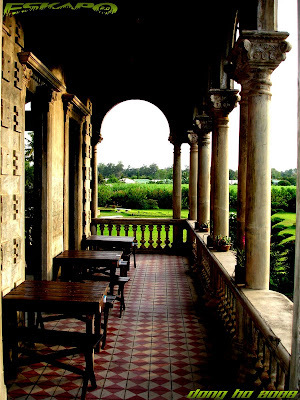 I like also the veranda where one can have food. The view at night must be beautiful. >hi em, the structure itself is so picturesque. you can just point and shoot on any angle. they say it's beautiful at night but i was not able to visit it by night. >hi rayts, thanks a lot! im quite humbled. but it's really nice to hear words like this from an experienced photographer. 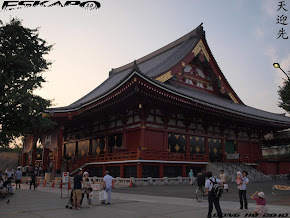 but i also believe that the structure itself is simply beautiful that at almost all angle, it gives you a nice view. 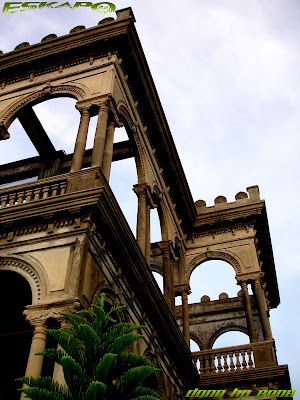 >hi bw, the ruins of this mansion is in the area of bata in bacolod city. it is somewhere in between bacolod and talisay. it can take you around 15-20minutes drive from the city. the place is secluded and is surrounded by sugar cane. if you need more information, just send me an email. >hi napaboaniya, yes. it retained the structures framework which still shows an elegant view of the mansion. >phivos, thanks. i still need a good camera and a lot of practice to improve things. >pietro, i also like the veranda view. next time i'll visit this place will definitely be at night. uy kuya nakabalik ka na pala mula sa bacolod, ganda ng mga pics ah. lalo na yong tower, at yong ambiance iba talaga. I love medieval stuffs. Mansions/Castles/Ruins or anything antique! I'm still waiting for my knight[s] in shining armor. it's actually nice to see something in here that I have personally seen as well. Hope you enjoyed your tour of Negros, Dong. Ang ayos naman ng ruins nato? Parang art-directed. It must have been a grand looking mansion in its heydays! To think that this is just the framing and was burnt...still looks beautiful! By just looking at the ruins, you can tell how well the sugar barons lives in the old days. In western visayas, negros occ. has one of highest poverty percentage in region 6. Not because they are economically poor but because very few families owns most of the land. Just Awesome photo's my friend! San part ng bacolod 2? Ganda! the mansion design is part of achitectural study,the design represent the corinthian design in the old days!. now, architectural knowledge, that a column is much stronger than the metal..
thanks dong isa na nmang kahanga hanga ang pag feature mo nito. these are some of your best shots, dong. beautiful. Is this mansion in the Philippines? It's so beautiful. At one glance on the first pic, I thought it was a painting. >mhar, oo. nakabalik na ako last tuesday. ganda nga ng tower tsaka medyo mataas na rin talaga ang tower na yan. >hi share, kaya naman pala gusto mo ang mga antique. hehehe... you will then enjoy silay city here in negros. >jasper, definitely. 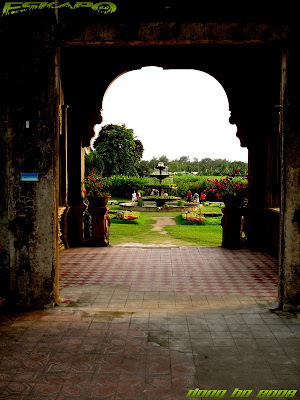 i've been to bacolod city several times when i was younger but i never had the chance to see these spots. it's good that this time, i was able to really roam. ganda ng negros occidental. >carlo, siguradong pwede ring maging tourist spot yon. saan nga pala sa bicol yon? >hi caryn, taga silay pala asawa mo. daming lumang bahay na makikita doon. 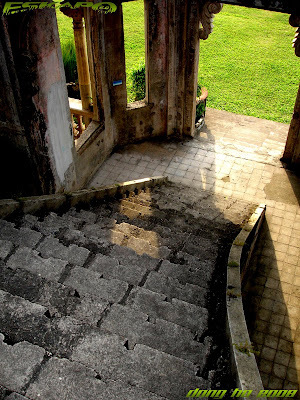 medyo sumisikat na nga itong ruins dahil ino-open nila for wedding photoshoots and small events. >hi mirage, i agree. this could have been very beautiful. i actually asked the tourist guide if they have a replica or a copy of the original house, but he said they've none as of now. >blogusvox, you have a good point. i believe that very few people were really rich. not sure if it is still like that today. >hi kathleen, so i assume that your husband is an architect or an interior design expert. maybe you can do a replica instead. >st charles, it's near bata in bacolod. just 15-20minutes from the city. it's in between bacolod city and talisay. >bryan, exactly. because it's partly based on italian houses. >ever, maraming salamat din sa mga additional info. dami ko tuloy natutunan sa yo. salamat din sa laging pagbisita. >eye, thanks a lot. im glad that you like it. >hi eunice, yes, it's in the philippines. 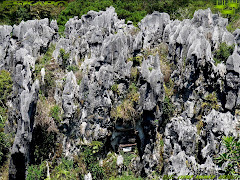 it's in the western visayas. an hour and twenty minutes from metro manila. >hi carlota, i also like the staircase of this mansion. how we wish we've seen it during the old days. >hi vanny, oo nga. ano na lang kung hindi ito nasunog. ganda talaga. Wow...what a nice house...even if it is in ruins ...it is still very beautiful ! Thanks for this reminder that nothing gold can stay. God bless, friend. Nice pics there, Dong. Thanks for dropping by at my Tennis post. I did play against the wall during my uni years. That's such a lavish looking mansion. I could imagine how beautiful it was before it burned. i love your pics. 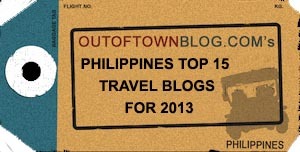 one day, i would visit bacolod and see all the places you posted here. >sidney, i agree. i really wish someone will be able to make a miniature or at least a replica of this mansion so that people will have a view of how beautiful it was before it was burned. nice to hear from you. im really hoping that you'll start blogging again. 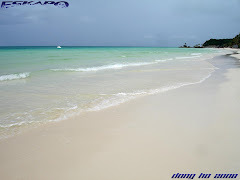 >hi sandy, thanks too for always taking time to visit my blog. God bless your week ahead. 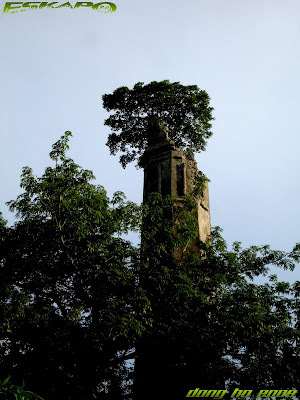 >tutubi, buti naman at kahit papaano nakapagtour ka sa post na to ng ruins. sana nga mabisita mo na rin ito. one time sabay tayo bumyahe. >hi rachel, same here. it definitely was a very nice mansion before. >kero, thanks a lot. that would be great. do you have a blog? ...and yet, all its beauty remained...what an extraordinary place! 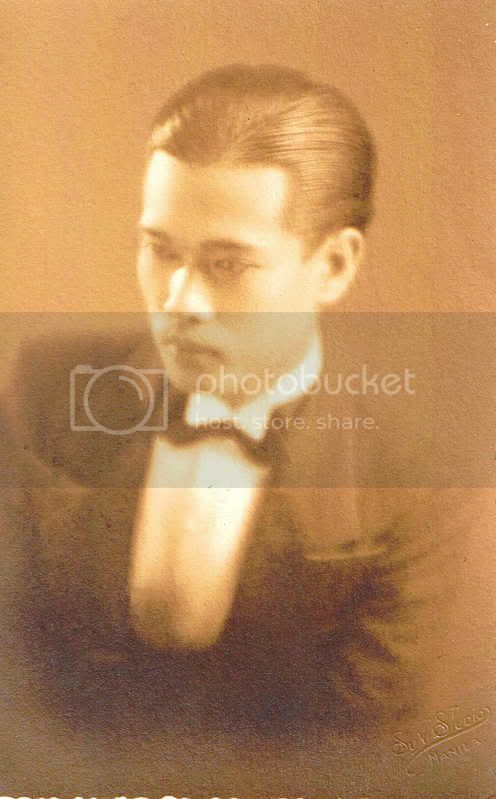 sir dong iyong mga nauna bang images, shots mo rin or from a previous one?..para rin kaseng painting. 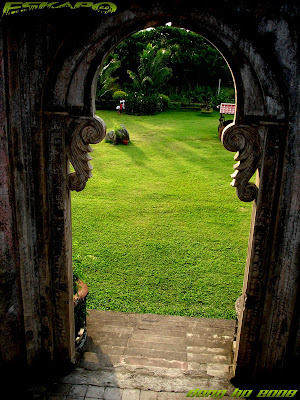 gusto ko ung atake mo don sa frame within a frame na kuha mo..marami palang mga ganitong picturesque material sa bacolod..veri relaxing sa mata ung merging ng brown and green colors. great capture!i can imagine the memories of the mansion when it was not yet ruined. great shots, especially the first one! Wow, these are wonderful pictures and stories...I just drop by from bitchy's blog and I'm so glad I did. Thanks for sharing bro! 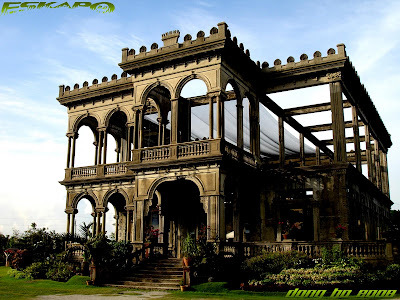 wow dong napuntahan mo pala itong "the mansion" sa bacolod! the house reach it's grandest before the war erupted. sayang lang it need to be burned down para hindi magamit ng mga hapon during the occupation time. wew.. it's very classic and graet!, I like it..
interesting details, bro. i particularly liked yung frame within a frame shot mo of the hallway looking out into the fountain area. wanted to go here nga when we went to bacolod pero i got sidelined with food poisoning. next time, we will. >l.reis, extraordinary indeed. what makes it a little special is it now serves as a coffee shop. >josh, yes. kuha ko ang lahat ng photos dito basta may dong ho watermark. i was there almost for an hour shooting different angles. 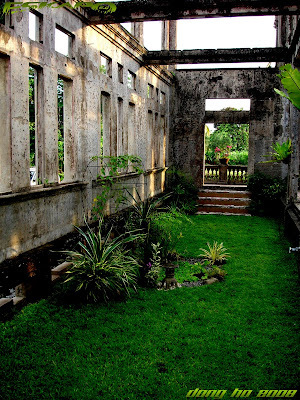 bacolod and other nearby negros occidental towns also offer a lot of old hacienda and mansion house. you really need to visit this place. >hi nyl, thanks! me too. i really wish someone keeps a photo of this mansion before it was burned. >barry, i agree. to some old ruins is a waste of space but definitely not the historical ones as it holds a special memory of our country's past. >raft3r, this gives you one good reason to go to bacolod again. >dennis, thanks! im glad that you like it. thanks to bithcy! i hope you'll keep in touch. >theonoski, oo nga. 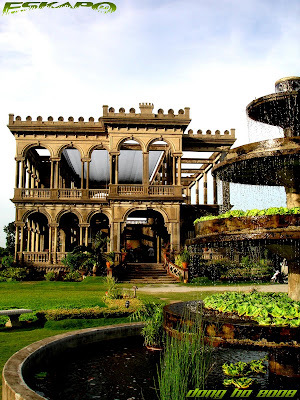 pero marami pa rin namang natitirang magandang mansion within the region of negros occidental na pwedeng bisitahin. sana makapunta ka rin doon. >alicesg, it's good to know you're back. might as well visit the philippines. >oggie, maraming salamat. oo nga sayang at hindi nyo to napuntahan. pero ok lang kasi hindi ka rin mag enjoy kung dala mo ang sakit ng tiyan doon sa site. This reminds me of Palace In The Sky in Tagaytay. Beautifully captured. This one we missed when we were there. Ganda nga talaga nya, especially with the lighting when you were there. Another place to go back to when in Bacolod. wow! it doesn't look like mansion ruins. maganda pa rin kasi tignan til now. i wonder how it looked before it was damaged. ang ganda ng captures mo ng ruins bro! you were blessed with great lighting. thanks for sharing. 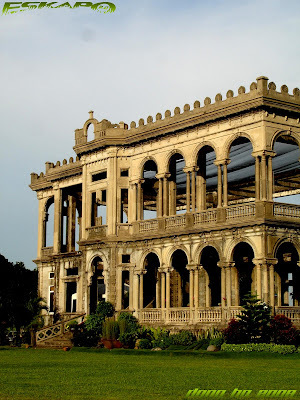 I've been to Bacolod several times but didn't have the chance to visit this place. awesome! do u happen to know the Architect? >hi joshmarie, thanks a lot. >abaniko, talaga? hindi ko pa kasi napupuntahan yon. >jayshkal, this is just one of those beautiful old buildings there. 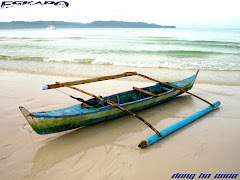 just imagine seeing a lot of these in the nearby towns of silay and talisay. >hi ifoundme, hehehe... oo nga. ikaw kasi talaga ang nagrecommend sa akin nito. sige sa susunod kong pagpunta dyan yung mga nasa talisay at silay naman. maraming salamat ulit. >ferdz, oo nga daw. mas magandang bisitahin ito during sunset at aabutan kayo ng gabi kasi mas maganda ito sa gabi. >beero, oo nga. maganda talaga ang structure. sana nga may mga pictures nitong building nung hindi pa nasunog. >hi arlene, it surely is beautiful. when i was there i was trying to imagine how beautiful its interior could be before it was burned. >allan, maraming salamat. medyo hapon na rin kami nagpunta pero mas maganda pa sana kung naiwan pa kami till dusk kaya lang may pupuntahan pa kami. pero ok na rin. sabihin mo lang kung pupunta ka doon. >ely, ngayon hindi ko pa alam. try ko iresearch. 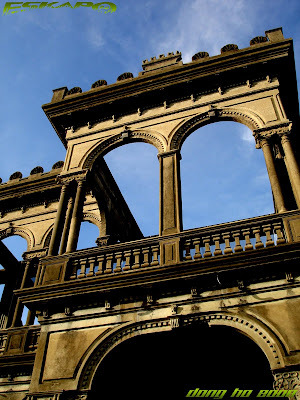 Dong, where exactly is this Mansion Ruins in Bacolod? >hi equi, ganda nga talaga ng mansion na yan. >hi rebecca, wow! thanks. this mansion has already been featured by many travel shows within the region and definitely soon in the magazines. >hi meikah, it's in the outskirt part of bacolod city. i think it's still part of bata. 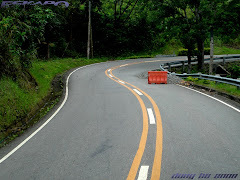 from bacolod going to talisay, just after pepsi, you continue driving straight until you see a sign "to ruins" on your right. turn right and just follow the road. there's a bette way there though but you really need someone to guide you there. >hi sandy, everyone simply loves it. >estan, maraming salamat! knowing that it comes from you pushes me to improve more. salamat bai! the first time i saw this mansion at ifoundme's blog, i fell in love with it! it inspires me to work harder and earn that bucks! >hi emily, ruined yet still beautiful. >geisha, hehehe... kala ko mag iipon ka para pumunta dun. yon pala mag ipon para magpatayo. 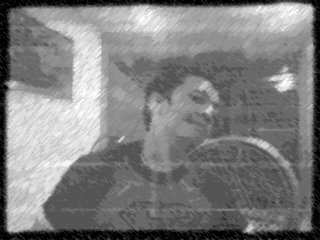 astig! a late discovery. great pics. will definitely check the place out when circumstances permit.